Indian families had spent more than three Lakh Crores on health. Its 62.6 percent OOP (Out of Pocket Spending) is considered. In order to deal with similar problems, Russian education had set up a medical checkup camp at Narela in Delhi. On Thursday, the Russian education team, along with NGO RoshanDan, started a medical camp in Navjivan camp of Narela village. At this camp around 300 needy people were checked for free. 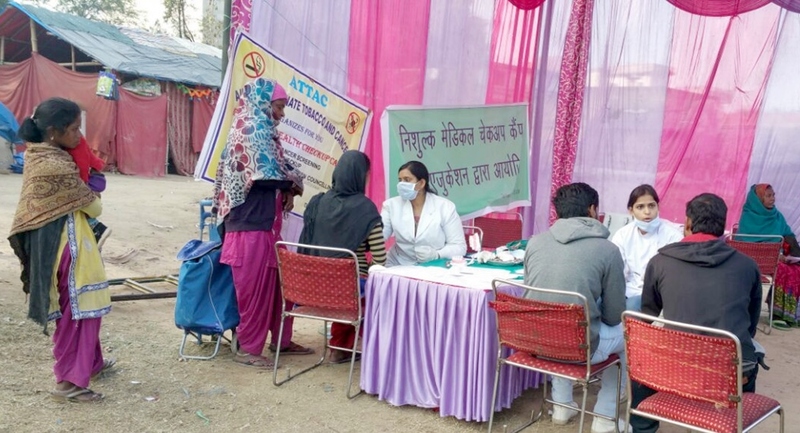 Body check-ups, oral cancer detection, dental checkups and tobacco quitting treatments were reported in the medical camp. Tausif Ahmad from Russia’s education told that 300 people were given free check up in medical camps, along with free medicines. “More than 300 people took advantage of this camp, 100 of these people went for the dental checkup. 50 people opted for cancer screening, out of which 3 were screened positive. And the rest underwent full body checkup”, said Dr. Poonam. “With this camp we have got a lot of benefits, we are now aware of the diseases”, said Jyoti, a patient.